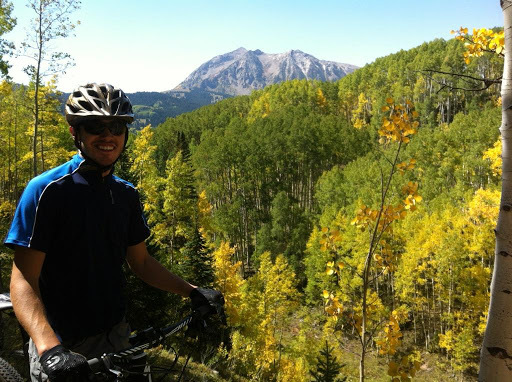 Every fall around late September the annual Crested Butte Classic takes place. Not only would this be my first CB Classic but it would be my first endurance race. I started to dabble in races this year but nothing this long. I figured if I want to get a feel for long distance races, the CB Classic, which is 100 miles, would be a great introduction as the vibe is pretty laid back. Still I was pretty nervous the day before the race. I woke up at 5:30am after an on and off night sleep with thoughts of the race going through my head. I made some bacon and eggs, chowed it down and got my bike things in order. The race start was at the Brick Oven Pizzeria, just a few blocks from my house. At 7:00am the sun was just about up and about 70 bikers took on Elk Avenue and eventually HWY 135 for the neutral start. Lap one started with the steep road climb of Strand Hill. It is usually a tough climb but everyone was taking it easy as I expect most endurance races start. I did however want to get in the middle of the pack. I reached the summit of the Strand road climb and started the decent. 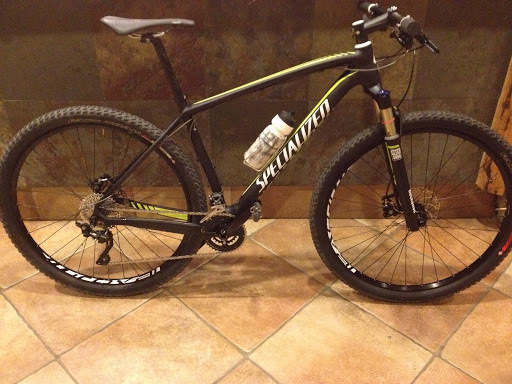 I was riding my new Stumpjumper hard tail 29er, it was only my 6th time on the bike. This was also my first hard tail, so the downhill was slow and rough on the body. The climb to the top of Deer Creek is very steep with a hike-a-bike section. I was just starting to get warmed up and feeling pretty good. I got to the ridge of Deer Creek and started my decent, again the new bike was holding me back. I am not a very good downhill rider in the first place but this was really starting to aggravate me. After a few more climbs and descents I got to Gothic Road. Thoughts started going through my mind as to weather I should push the pace more or continue to go at my current pace. I ended up taking advantage of the road riding and pushed pretty hard. I went home to eat some bacon, refill on water and snacks and check in with the race volunteers at the Brick Oven. On to loop two which brings riders up and over Slate d’Huez which is a brutal forest road climb. Here I passed about 5 other riders and felt really good. Once I got to the top I knew I needed to haul down 403 which is a very technical and steep decent, I did just that. After I dropped down on to Gothic Road, I started another long prolonged climb up to Schofield Pass and eventually the climb up 401. At this point I was almost out of water, I was carrying 24 and 16 ounce bottles in my cages. I started to worry about dehydration. I savored my last bit as I got to the top of the 401 climb. All out of water and very thirsty I descended down the fast and flowey 401. This year the race included lower 401 which has a few power climbs, this was no easy task after 60 miles of riding behind me. I was super thirsty at this point and was thinking I would stop in the town of Gothic at the Maroon Hut to fill up at the spigot. I never ended up getting water, and started biking up Gothic Road again at a pretty good pace. Me on the Dyke Trail a week earlier. After more bacon and refills at my house, I check in at the Brick Oven again and head out to the Dyke Trail, the final loop of the Classic. At this time in the day there is usually a good head wind coming from West to East. As I headed West I could really feel it. I started the climb up Kebler Pass and caught up to another rider, Billy Laird. We introduced eachother and chatted about what position we were in. I told him I thought were top ten, but it was hard to say. We rode together for a while until I pushed on with a slightly faster pace. Once I got to the top of the Dyke Trail I start to feel pretty tired, and as fitting as it sounds I took a super narly crash. I don’t even know what happened but I just lost control of my bike and slid head first down the trail. Initially I thought I hurt my wrist pretty bad as I put it out to brace myself. I sat on the ground hurting, then inspect my bike. For a moment I considered quitting, but I had made it so far I couldn’t quit now. After a quick inspection of my bike, I saw my front tire was out of true but everything else looked good. I continued on hurting. Every uphill hurt my body in some place or another but all I could think of is getting down to the West side of Kebler Pass. My pace was slow but I ended up passing a few people; guy that got a flat, and another guy that broke his frame, then finally Dave Oches and Evan Ross both Alpine Ortho Riders just before the final decent. Knowing my downhill skills were lesser than theirs, I told them I would be ready for them to pass me, and they eventually did. After the downhill I reached the West side of Kebler Pass. I caught up to Dave and Evan as they were chatting and not riding too hard. I passed them only to have Dave catch up with me shortly after. I beat Dave to the top of the pass but he soon turned on the burners and took off. As I rode down to town by way of the Wagon Trail, I felt very accomplished. Not only will I finish the race but I think I did a heck of a job overall. Sure, I could probably ride these trails in my sleep, but I was stoked. I finshed the remainder of Kebler Pass and rode into town. I arrived at the Brick Oven to be beyond surprised with a 5th place finish. A amazing experience for my first Endurance race, I think I’ll try another!